(c) if ADRIC is administering the arbitration, paying a Commencement Fee as set out in Schedule B of the Rules (see below). 11. a statement of any variations or exclusions of the Rules to which the parties have agreed in writing. 2. a copy of the contract(s) (if any) related to the dispute. (b) if ADRIC is administering the arbitration, paying a Commencement Fee as set out in Schedule B. Parties to the dispute must sign the Notice of Submission to Arbitration and the notice must contain the information listed in Rule 2.1.2 and append a copy of the contract(s) (if any) related to the dispute. (ii) delivers only a Statement of Defence, in which case the Case Service Fee is determined by reference to the amount of the claim. ADRIC does not charge fees for hearings, postponements, and miscellaneous expenses. 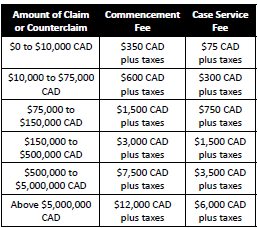 The Commencement Fee and the Case Service Fee are non-refundable once paid.